If you want to stay near the Tour Eiffel, we recommend choosing a hotel in the western half of the 7th arrondissement. ABOVE: The Hotel de Latour Meaubourg (behind fountain) faces a public park near the Invalides, within walking distance of the Eiffel Tower. The Eiffel Tower neighborhood is a perennial favorite with foreign visitors to Paris--possibly because of the Tour Eiffel's popularity, but also because the area is pleasant for strolling after dark, when the tower is illuminated by 336 light-beam projectors and 20,000 light bulbs sparkle for the first five to ten minutes of every hour between sundown and 1 a.m. When booking a hotel near the Eiffel Tower, it's important to know that the tower lies on the border of two arrondissements or districts: the 15th on the west, and the 7th to the east. The section of the 15th arrondissement near the tower is dominated by large modern apartment buildings and hotels, while the 7th has more of the charm and atmosphere that visitors associate with Paris. The 7th is also convenient to other major tourist attractions, museums, and shopping on both the Left and Right Banks of the Seine. We suggest choosing a hotel in the western half of the 7th arrondissement if you want to be near the Eiffel Tower. The listings on this page meet that requirement. Every room at this stylish modern luxury hotel has a Mac Mini computer, along with free Wi-Fi. Le Cinq Codet is close to the École Militaire Métro station. The modern hotel has an iPad in each of its 40 rooms. It also offers a bar, a fitness center, and a hammam. Wi-Fi is free, and pets are welcome. All 32 rooms have free Wi-Fi, with accommodations ranging from singles to four-person family rooms. The 7 Eiffel is a few blocks east of the Champ de Mars, close to the La Tour-Maubourg Métro station. The Bourdonnais is two short blocks from the Champ de Mars, the large park that runs inland from the Eiffel Tower and the Seine. The École Militaire Métro stop is close by. The 53 modern rooms and suites accommodate two to four guests. Wi-Fi is free, and if you book an executive room, deluxe room, or junior suite, you'll be given a Samsung smartphone to use while you're in Paris. This hotel, which is housed in a traditional Paris building, is only a very short walk from the Eiffel Tower and the Seine. The nearby Pont de l'Alma RER station offers quick connections to destinations throughout the Paris region. The pet-friendly Derby Alma has 33 rooms--all with free Wi-Fi--including doubles, twins, and junior or family suites. A bar is on the premises. This 25-room boutique hotel is east of the École Militaire (and its Métro stop) on the Avenue de la Motte Piquet. Room decor is a blend of the modern and traditional, with free Wi-Fi throughout the premises. Other features include a garden courtyard (where guests can enjoy breakfast or drinks in good weather) and a bar. The Tourville Eiffel is about 10 minutes on foot from the Eiffel Tower. It's located on the Avenue Duquesne, slightly east of the École Militaire. A Métro stop is about a block away. The hotel's 30 rooms are cheerfully decorated and range from doubles (with or without terraces) to family suites. Pets are welcome, and Wi-Fi is free. This 40-room hotel is on the eastern side of the Ecole Militaire (and just south of its Metro stop), a few short blocks from the Champ de Mars. Its decor is a mixture of the traditional and modern, and the better rooms have balconies with Eiffel Tower views. Wi-Fi is free. A bar, café, and restaurant are on the premises. The hotel also offers a library, fitness room, and hammam or Turkish bath. The Saint Dominique is beautifully located for an Eiffel Tower hotel, to our way of thinking: It's a few blocks east of the tower and the Champs de Mars, yet close to both the Seine and other major tourist attractions along the Left and Right Bank. RER and Métro stations are also within walking distance. The hotel has 32 rooms (all with free Wi-Fi, and--unusually for Paris--free drinks in the minibar). In good weather, you can enjoy breakfast on the patio. Finally, if you left your iPad at home, you can borrow a tablet from the front desk to plan shopping, dining, and sightseeing. Foodies, take note: Rooms with iPads and free Wi-Fi are only the tip of the amenities iceberg at the Hotel Thoumieux. The Michelin two-star Restaurant Gourmet Sylvestre is also on the premises. The cozy Thoumieux has only 15 rooms (all doubles in various categories). 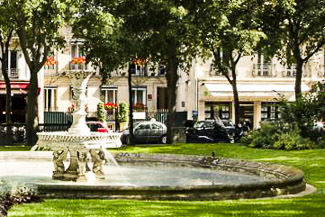 The hotel is located between the Champ de Mars and Invalides on the Rue Saint-Dominique, within an easy walk of the Invalides Métro and RER station. In Europe, Best Western is a solid upper-middle-class hotel brand, and the Tour Eiffel Invalides is a good case in point: The hotel has 30 rooms, all with air conditioning and free Wi-Fi, plus a garden and a cellar breakfast room with vaulted ceilings. The Best Western Tour Eiffel Invalides is east of the Champ de Mars near the gardens of the Invalides, just north of the La Tour-Maubourg Métro station. The Invalides RER and Métro station is also nearby. The Beaugency is on a neighborhood street east of the Champ de Mars, a few minutes away from the École Militaire and La Tour-Meaubourg Métro stations. The hotel has 30 rooms (all with free Wi-Fi), including several adjoining rooms that be connected to create family suites. The surrounding neighborhood offers a good choice of cafés, and restaurants, and shops--among them, bakeries, which are essential to any Paris stay. This highly-regarded hotel is just off the Rue de Grenelle, east of the Champ de Mars and within a few blocks of two Métro stops. All 26 rooms have air conditioning, free Wi-Fi, and everything you need to make coffee and tea (an amenity that's missing at most Paris hotels). Some of the double rooms provide views of the Eiffel Tower, and the hotel's breakfast room opens onto a patio. This hotel is on the Rue Cler, east of the Champ de Mars and within easy walking distance of the Eiffel Tower or nearby Métro stations. All 50 rooms have free Wi-Fi, and you can book adjoining rooms if you're traveling with children or other family members. Some rates include a buffet breakfast. Location is a major selling point for the Alma: The hotel is close to the Champ de Mars, on a quiet street in a neighborhood with plenty of restaurants and cafés. The 31 single, double, and twin rooms are not air-conditioned, but they do have free Wi-Fi, and you can relax on the terrace in good weather. Note: This hotel may be slightly more hit-or-miss than some of the other hotels on this page, but it may be worth considering if the location appeals to you and its rates are competitive for the time of your visit. This small hotel is named after its location: It's on the Avenue de la Motte Picquet, east of the École Militaire and the foot of the Champ de Mars (the park below the Eiffel Tower). The Motte Picquet has only 16 rooms, but they offer surprising variety, ranging from single rooms to three- and four-person suites (all with free Wi-Fi). Cafés and other neighborhood amenities are in generous supply at the Hotel de la Paix, which is located close to the Champ de Mars and the Eiffel Tower. The 23 rooms tend to be small (as in most Paris three-star hotels), but all are air-conditioned and offer free Wi-Fi. The Latour Maubourg is just a few meters from the Métro station of the same name, not far from the Place des Invalides. Its 19th Century building faces a public park (see photo at top of page). The small hotel has 17 rooms--all with free Wi-Fi--plus a heated courtyard and a Turkish bath where you can relax after a long day of walking and sightseeing. The 41 modern-styled rooms at the Hotel du Cadran are air-conditioned, with free Wi-Fi, and come with beds for two to four guests. The hotel is located on the Rue du Champ de Mars, between the Eiffel Tower's park and the Invalides. The closest Métro stations (both on Line 8) are La Tour-Maubourg and École Militaire. Like many of its peers, this hotel is a few blocks east of the Champ de Mars (the large park that runs south from the Eiffel Tower), with two Métro stations nearby: École Militaire and La Tour-Maubourg. The hotel's 25 single, double, and twin rooms have free Wi-Fi and fans for use in warm weather. For best views (including the Eiffel Tower, if you're lucky), book a superior double room. The Duquesne Eiffel is on the southern edge of what we consider to be Eiffel Tower territory: It's a couple of blocks inland from the Champs de Mars and the École Militaire Métro station. On the plus side: The hotel has earned excellent scores from Booking.com clients, some rooms come with views of the Eiffel Tower, and all 40 single, double, and triple rooms have air conditioning and free Wi-Fi. The Duquesne Eiffel also has a comfortable lobby bar. This hotel is a few short blocks east of the Champ de Mars (the park where you'll find the Eiffel Tower). The École Militaire Métro station is about 400 meters or a quarter-mile away. The Eiffel Rive Gauche is pet-friendly, with no extra charge for pets, and Wi-Fi is free in the 29 single, double, and twin rooms. A bar is in the lobby, where a free wine and cheese tasting takes place daily from 6 to 8 p.m. Walk a few blocks west of the Le Pavillon, and you'll hit the Champ de Mars. At that point, the Eiffel Tower will be only a minute or two away on your right. The tiny and stylish boutique hotel, housed in a former convent, has 15 rooms and a garden patio. Three of the rooms are "adapted for guests with electromagnetic sensitivity" (meaning no phone or Internet), but the other 12 offer free Wi-Fi. The closest Métro stops are La Tour-Maubourg and Invalides. From the latter, you can also catch an RER train to Versailles. "Muguet" means "Lily of the Valley" in French, and the flower has long been associated with good luck and May Day (Labor Day) in France. So much for floral trivia: The Hotel Muguet, or Lily of the Valley Hotel, is a popular 40-room establishment on the Rue Chevert, roughly midway between the École Militaire and La Tour-Maubourg Métro stations. From the hotel, it's only a short walk to the Champ de Mars and another 10 minutes or so to the Eiffel Tower. All of the Muguet's double, twin, and triple rooms are air-conditioned, with free Wi-Fi. Some rooms have views of the Eiffel Tower. The "Eiffel Gardens" is in a quiet side street between the Champ de Mars and the gardens of the Invalides, close to the La Tour-Maubourg Métro station. It has 81 modern rooms, some with balconies and Eiffel Tower views. Guests also can enjoy the hotel garden, where breakfast is served in good weather. In addition to the usual queens and twins, the Jardins Eiffel has a number of single rooms. (All rooms are air-conditioned, with free Wi-Fi.) Parking is available on site for a steep daily fee. The Amélie enjoys unusually high guest ratings for a hotel in its category. One reason is location: It's on a quiet neighborhood street just off the Rue Saint-Dominique, which runs between the Champ de Mars and the Invalides. The Seine is only a few blocks away to the north. Pets stay free at the Amélie, which has 16 single, double, and twin rooms (all with complimentary Wi-Fi). The Eiffel Turenne is another winner in the two-star division: Guests love it, and it's only a minute or two from the École Militaire Métro station and the Champ de Mars. All 34 of the hotel's single, double, and triple rooms are air-conditioned (with free Wi-Fi), and you can book connecting doubles if you need more space. Other amenities: Double-glazed windows reduce noise from the street, you can order breakfast in your room if you'd rather not trek downstairs to the buffet, and there's a laundromat near the hotel. The Kensington may be a long way from its namesake district in London, but it's only two short blocks from the Champ de Mars and a quick walk from the Eiffel Tower. The hotel has 25 rooms (all with free Wi-Fi), including adjoining doubles or twins that can be connected to create family suites. The nearest Métro station is École Militaire, about 1300 meters or 3/4 mile away. This hotel is a bit farther from the Champ de Mars and the Eiffel Tower than some other hotels in the western half of the 7th, but it's also closer to the Seine than most. We think you'll be pleased with the location. The Malar is animal-friendly, and your pet--like the Wi-Fi--is free. In addition to a selection of double and twin rooms at various price levels, the hotel has a garden with tables, chairs, and a gnome to keep you company. The Tour Eiffel is an easy walk from the hotel of the same name. The hotel is a few blocks east of the Champ de Mars and about 500 meters or a third of a mile from the École Militaire Métro station. The 23 rooms include singles, doubles, twins, and triples, with connecting rooms for up to five adults. All rooms are air-conditioned, with free Wi-Fi. Some rooms have Eiffel Tower views, while others face the garden courtyard. The Royal Phare is a boutique hotel that was fully renovated in 2016. It faces the École Militaire Métro station and is within walking distance of the Eiffel Tower, Napoleon's Tomb, and other attractions in the 7th arrondissement. Thanks to the recent renovation, the Royal Phare meets EU accessibility standards for guests with wheelchairs.